It’s time to have some fun in the kitchen. These Easter-inspired desserts and activities will help everyone have a good time! It’s always fun when you can get the whole family into the kitchen. These three fun treats are sure to have the whole family smiling and of course will bring tons of fun to the kitchen. This is a fun spin on the tradional campfire dessert recipe. 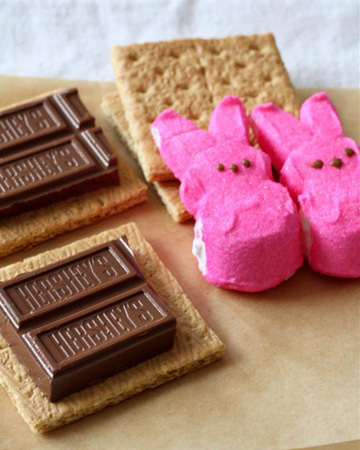 Just replace the classic marshmallow and use a Peep instead. It’s deliciously sweet! Add chocolate and the Peeps to one of the chocolate halves. Microwave for a few seconds (you will see the marshmallow start to puff). Top with other graham cracker half. These little carrots are perfect in the Easter basket or as a delicious lunchbox surprise. Feel free to mix it up and use any orange colored candy or cracker. 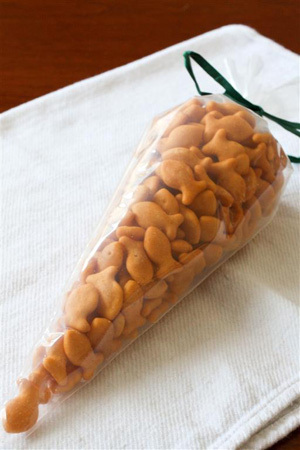 Fill piping bag full of golfish crackers, and leave about four inches at the top. 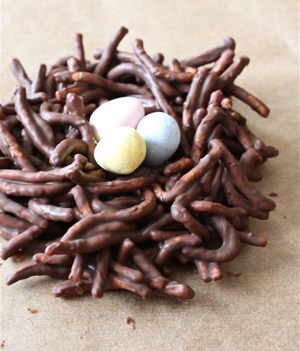 These sweet little chocolate bird nests are a perfect decoration and dessert for Easter. The kids will love to help shape them into little nests and add the sweet chocolate eggs. Add chow mein noodles and stir to combine (if the mixture looks too loose, add some more noodles). Divide mixture into four parts, spoon onto parchament paper and shape into nest. Put little chocolate or malted eggs into nest and let the chocolate set up for about 30 minutes.